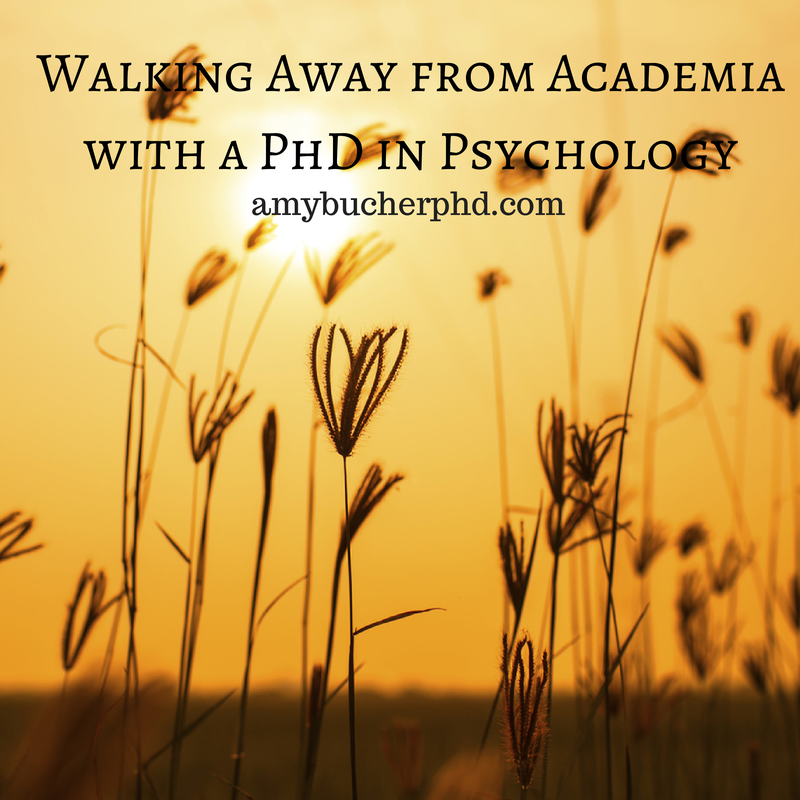 Walking Away from Academia with a PhD in Psychology | Amy Bucher, Ph.D.
For many people pursuing a Ph.D. in psychology or a related field, there is an assumption that their career plans involve the tenure track. This is increasingly not true. When I graduated with my Ph.D. from the University of Michigan, I didn’t know too many people in my field who had left the academy with their degree. My mentors struggled to help me with my job search and career aspirations, not for lack of caring, but for lack of experience. I wasn’t even sure how to look for job openings for non-academic jobs. However, my years working in the corporate world have brought me into contact with many psychologists who made the same type of decision I did. Many never entered academia at all; others did, then left; and still others with clinical backgrounds made similar transitions out of patient practice. We don’t all have the same reasons for our choices, but a few themes are common. First, as I mentioned in my post on considering even getting a Ph.D., the academic job market is over-saturated with newly minted doctors of philosophy. There simply aren’t enough academic jobs available for all new Ph.D. graduates, a situation made worse by low turnover at senior levels due to the tenure system. If being a professor isn’t your dream, it may not seem logical to pursue that track against tough odds. Moreover, many rising Ph.D.s put a premium on having more say over their location and career track. An academic career may require people to move to the university with the open position, even if it’s thousands of miles from family or a mismatch with preferences. Over the course of the tenure process, a failure to advance to the next level could mean not just a forced change in job, but a significant physical move to wherever a new position is available. I wanted to have a say in where I live and when or if I move. For me, a third consideration was what I’ll call “time to market.” I loved both the teaching and research components of academic life, but was frustrated by the long lead time between when I’d actually work on a project and when it would be introduced to the world in a way that might influence practice. In psychology, it often takes years to see a research study published in a journal, once all of the steps are factored in. In the corporate world, for all of its flaws, there are usually ways to have a quicker impact. Finally, and it may be gauche to say it, but I think the economic benefits of the corporate world are more reliable. It’s possible to be paid really well in academia, but it’s more likely that, at least initially, you won’t be making as much money as you would in a corporate job. The trade-off is that if you do achieve tenure, you have unparalleled job security. I absolutely do not mean to imply anything negative about wanting to go for an academic job with your Ph.D. Academia has many wonderful qualities that are different from the corporate world. To name just one, academia allows you to pursue your own intellectual passions with a freedom you usually don’t find in a Fortune 500 company. But the choice to pursue academia is not for everyone, and I want to provide a voice for the people like me who choose differently. We’re not so weird. What factors influenced your choice of career? Does academia or corporate life appeal to you more? Why?